As more and more people look to micro-dwellings as a solution to the city's affordable rental crisis, a builder shares some tips on how to thrive in the tiny spaces. When Chris Sabourin first got the keys to his 390-square-foot apartment, he didn't know what to do with all the space. The 57-year-old previously lived on the streets. Before that, he moved between a rooming house, a shelter and even did a brief stint under a bridge in downtown Hamilton. "I'm so comfortable here," the one-time landscaper said, referring to his tiny apartment that is roughly the size of two-and-a-half parking spaces. "It's everything I ever prayed for." 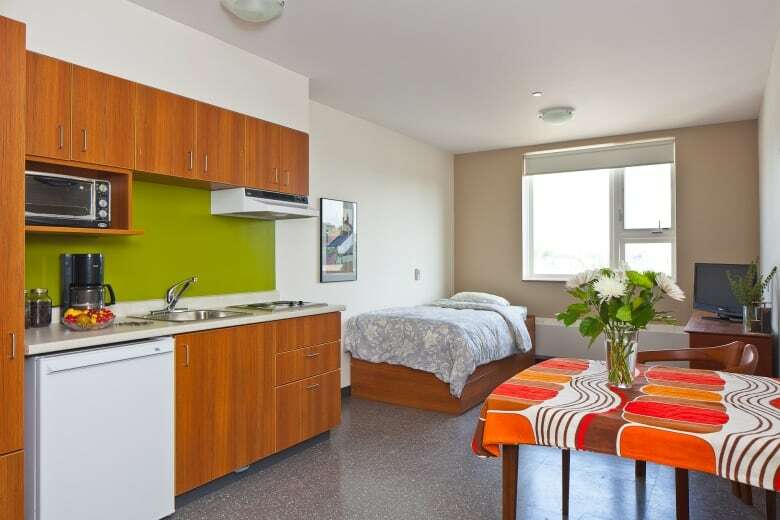 Sabourin's contentment is a promising sign for the increasing number of people looking to micro-apartments as a viable solution to the city's affordable housing crisis. The charity that built Sabourin's unit, Indwell, last week announced a new project at the former Royal Oak Dairy building that will feature many similar sized units. Indwell has six mixed-use buildings in Hamilton that have units leased to low-income tenants. The charity's project developer, Graham Cubitt, says it costs about $200 per square foot to build the apartments. 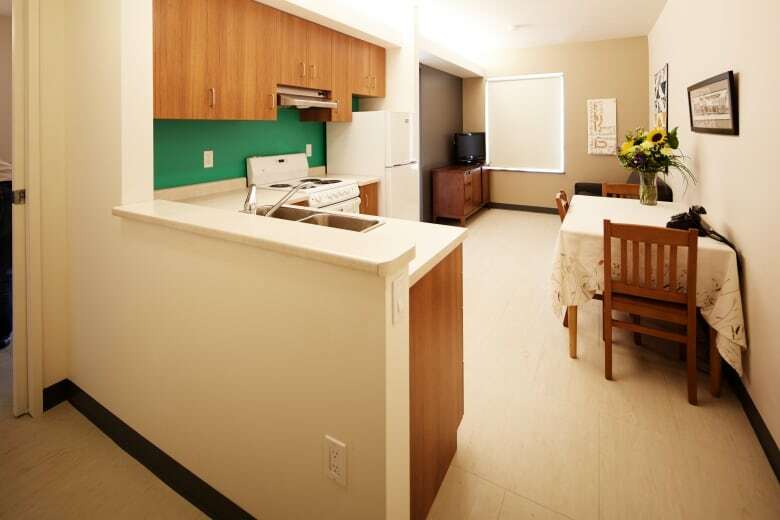 With a limited budget, smaller spaces means more affordable units. The units in Sabourin's Main Street East building typically rent at $500 per month. His space is stylishly furnished with a gray sectional couch, lime green dining set, a king bed, a TV set and is still roomy enough to allow for three or four people to move about without bumping shoulders. Cubitt says there are practical tips and tricks can help turn small and sparse into comfortable and cozy. The first thing to look at is the "flow" of the apartment," Cubitt suggested. That refers to things like where doors are located, how the doors swing, how drawers pull out, where light switches are located. "That sort of thing is really important because it allows for people to move around well within the space," Cubitt advised. Colour and lighting can also make space seem larger than it is. "The size of the windows are really important, you have to have big windows because it gives a sense of openness," Cubitt said. "Even things like painting one wall a different colour, like an accent colour helps." Sabourin's walls are all white except for one side that's dark gray. His cupboards are a teak woodgrain that helps add dimensions to apartment, Cubitt said. "It's like a game of illusions," he explained. But at the end of the day, there is still less physical space - and that means shedding some stuff. Cubitt and his wife Emma lived in one of Indwell's 250-square-foot apartments to test out the functionality of the space. "We didn't take our camping gear with us, sports equipment, that sort of thing," he said. "Its usually the seasonal things that needs to be switched out; winter clothing, Christmas decorations." Leaving behind their stuff to live in the small space was an eye opener for the Cubitts. "It was different, but there was also a sense of 'Wow there are so many things that we accumulated that we didn't need.'" "You can't find your identity in the things you own," he said. "We are used to, in our society, measuring status by the things that we have. Shifting that paradigm is really important." For Sabourin, the most valuable thing about his new apartment is the community that comes along with it. "We know each other, everyone is wonderful. I feel so safe and secure in this place," he said. Social isolation was a concern when building the smaller units, Curbitt said. And so Indwell included common areas to foster a sense of community. An open room on Sabourin's sixth floor features tables, chairs a kitchenette and computers. A few floors down, a terrace offers tenants a chance to relax together. It's more than enough for Sabourin. "This place, it's hard to explain how I feel about it. It's home," he said.